Some eggplants began to appear in our garden. 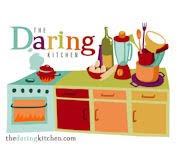 I also finished my first Daring Baker's challenge, the details of which I can only reveal on Thursday. The results of the challenge became gifts for my nearest and dearest. R and I made 6 litres of chicken stock and froze it. And we watched a scary amount of Grey's Anatomy on DVD. So all up it was a pretty damn good time.